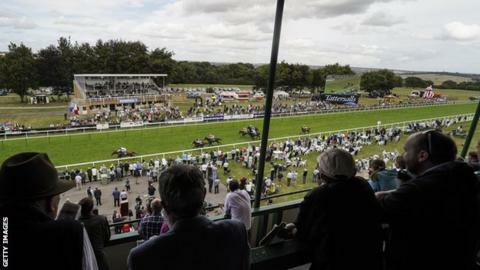 Salisbury Racecourse has been forced to cancel a twilight meet because of a bug infestation. Tuesday's meeting was abandoned after the track was found to be unfit for racing due to apparent chafer grub damage. Loose turf was found on the course's loop section during a morning inspection. "Safety was the most important consideration" in their decision, the racecourse said on Twitter. Chafer grubs live in soil and feed on decaying plant material or plant roots. Some species attract larger animals, such as badgers and foxes, who then feed on them, damaging the ground. "It's not something I've ever seen here before since arriving in 2001," said clerk of the course Jeremy Martin, who added that "badger scratchings" had also been found. As a result of the cancellation, hundreds of left-over sandwiches were donated to a homeless charity. An eight-race card scheduled for Friday on Salisbury's unaffected straight course will go ahead.